After 5 years my old cast iron skillet’s handle cover was worn out. The top edge was scorched and the stitching was frayed. So it was time for a new handle cover. I got a ball of t-shirt yarn and crocheted this new handle cover. I have wanted to learn how to crochet using a Tunisian stitch and decided to try a small recycled material project to start out. I used a strip of t-shirt cut about 1/4 inch wide and then stretched it gently to curl it into what I like to call curled t-yarn. Using the curled t-shirt yarn and a I sized Tunisian crochet hook, I set out to crochet myself a t-yarn coffee cup mat. I found this Tunisian stitch picture tutorial very helpful in learning the basic stitch. I bought myself a new cast iron skillet today. I love cooking with cast iron. No worry about non-stick coatings coming off the skillet and eating the coating material. Cast iron cooking pots and skillets literally can last a lifetime if cared for properly. So I needed a medium-sized skillet for cooking and bought myself a new Lodge cast iron #10SK 12 inch skillet. Of course I needed a new handle cover for the new pan. I have crocheted pot covers for my other cast iron pans and they are so handy. You don’t need a potholder to move it and the handle cover is always on the pan. I just leave the cover on the pan as generally the handle doesn’t need cleaning or seasoning. 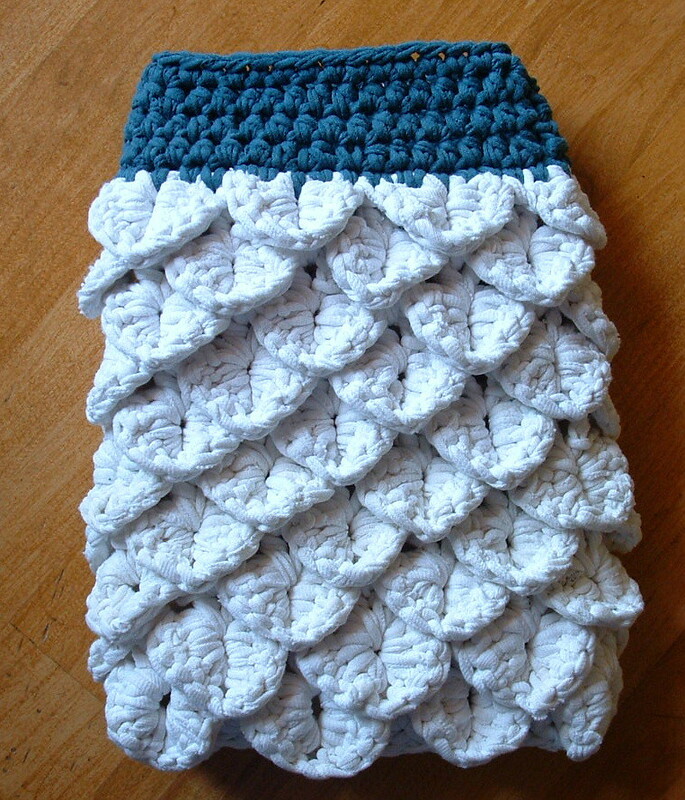 Here is the free crochet pattern for the t-shirt yarn handle cover. I cut my t-shirt strip in one continuous strand about 1/4 inch wide. Then I gently stretch the narrow strand which causes it to curl in on itself. I call this material curled t-yarn. 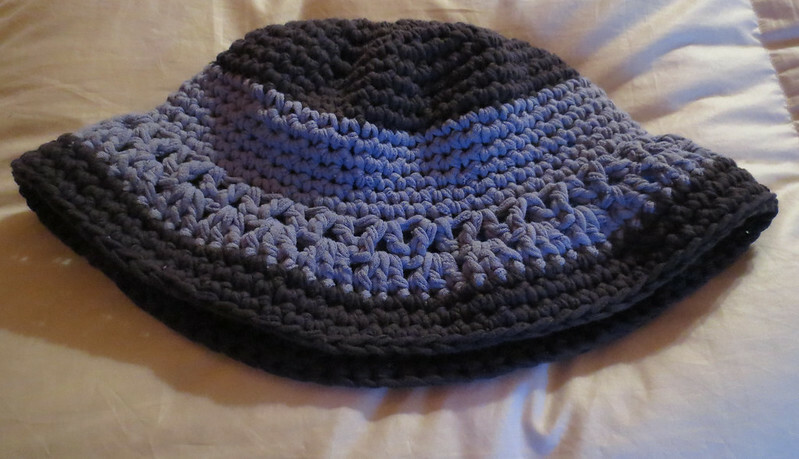 This ice cozy was crocheted from a T-shirt cut into strips to create T-yarn or tarn. I often use an icy brick in my lunch bag and wanted a little cozy for it. The ice block gets wet and has condensation after a while in my lunch bag. Now with the tarn ice cozy, it works wonderfully to keep my lunch bag dry and to capture the condensation from the ice brick. I cut my T-shirt strips very narrow to make this cozy. Here is my T-yarn tutorial showing how I cut and stretch my strips to create what I like to call curled T-yarn. The only change you want to make for this project is to cut your strips only about 1/4 inch wide. I know this is narrow but if you cut slowing and carefully it works out so you have a nice thin strand to crochet with. 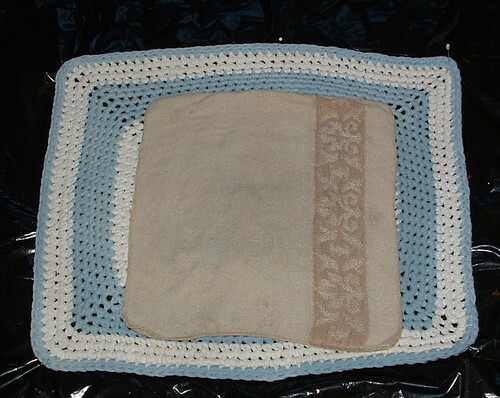 I used the following soap saver pattern to crochet my ice brick cozy. 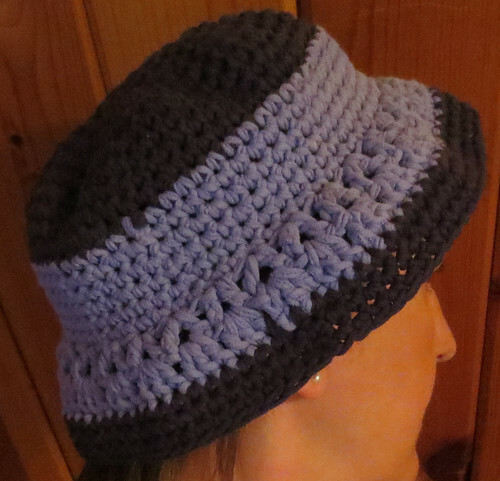 This tarn project and free crochet pattern was a Tarn Along over Recycled into Yarn site. The final measurements are 6 inches long by 3-1/2 inches wide. I did make mine a bit bigger at the beginning and crocheted 3 DC’s in the corners so the icy block would fit and its plenty big. I have 28 stitches in the bag around with 8 crowns at the top. 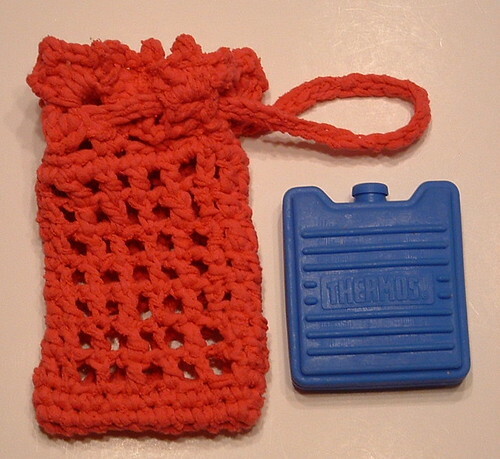 The tarn cozy was made with less than one T-shirt and could be used for an ice cozy as I have done, a soap saver, or even an i-Phone holder as shown here that Teresa did in the original Tarn Along. 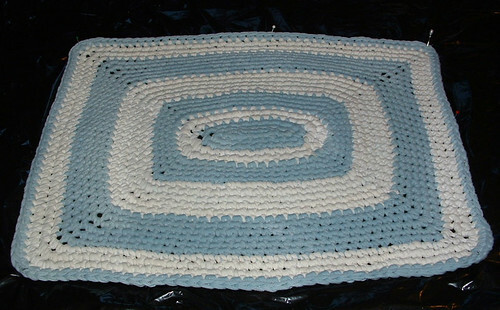 This week’s project is a rug I crocheted from a couple of old white t-shirts and the remaining pieces of a blue jersey sheet. I cut my cotton into 3/4 inch wide strips using my t-yarn making tutorial. Recycling t-shirts and old cotton sheets is a great way to repurpose those old items into new usable rugs, oven mitts, trivets, baby bibs, and more. 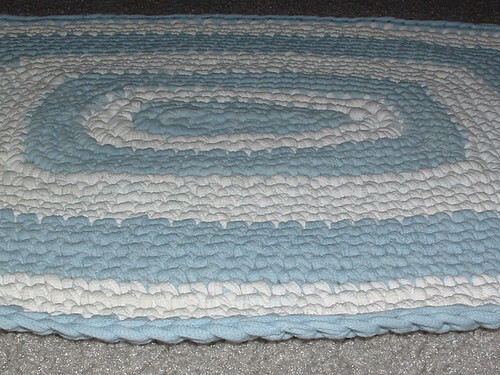 Once completed, this t-yarn rug had a problem. The center was not flat and the rug needed blocking badly so this week’s project turned into a two-fold post. A blocking tutorial for t-shirt yarn rugs and the free crochet pattern for the rug. I didn’t take a photo of the rug before blocking but trust me, the center was all rumpled up and the rug wasn’t laying down flat. 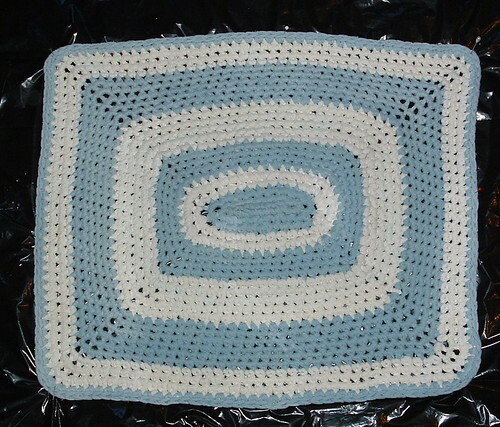 I used the same process I did when I blocked a round ripple afghan that was bowl-shaped in the center. My blocking method helped flatten both projects and really saved me a lot of frustration so I wanted to share how I did it. So first I will show how to block a t-shirt yarn rug. Lay the rug down and stretch it out on a large piece of plastic on the carpet. I used a large trash bag and then just reuse it for the next blocking project. I pin it all around as I stretch the rug and shape it. Use lots of pins and push them down into the carpet to hold the rug in place. Then using a wet rag or wash cloth, press down and wet the rug. Move your cloth around and continue to wet it and as you do, shape and stretch your rug. 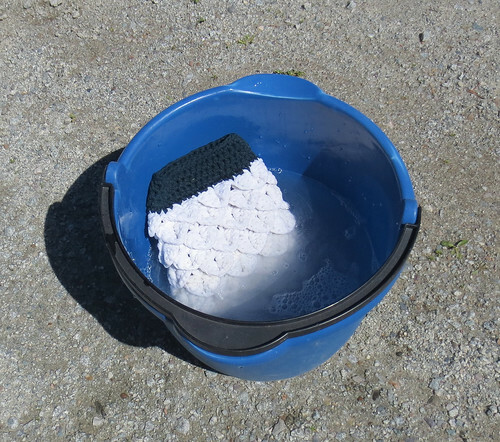 I laid a wash cloth down as shown and with my hands flat, I move my hands around on top of the cloth. My center was the real problem area so I pressed down and wet this area more as I worked out the rumpled center. Next photo shows after I have been shaping and flattening out the center. Move your pins as needed to get the rug flat and a nice shape. Gently pull on the corners and edges to get it as straight and square as possible. Apply more water on a rag as needed. Once you have the center flat and the rug shaped, its time to let it dry. I let my rug dry overnight with the pins in place. The next day, I removed the pins and flipped it over gently and let the back dry. The next morning the rug was completely dry and the rug held its shape rather nicely. Closeup of the t-yarn rug once it was blocked and flatten. As you can see its pretty flat and I can live with how it looks now. I hope you find this t-yarn blocking tutorial useful should you find your rug or other projects need a little flattening.